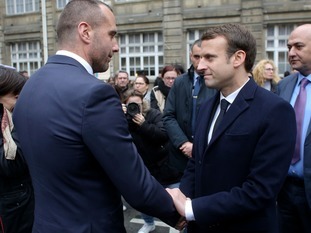 The police officer killed by an Islamic extremist on the Champs-Elysees has been honoured by French President Francois Hollande in a national ceremony in Paris. 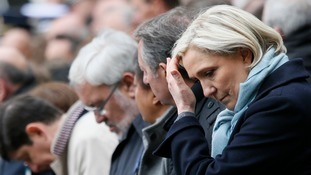 Presidential candidates Emmanuel Macron and Marine Le Pen were among mourners paying their respects to Xavier Jugele at the Paris police headquarters. The slain officer's partner, Etienne Cardiles, appealed in a speech: "Let's stay dignified, let's take care of peace and preserve peace." 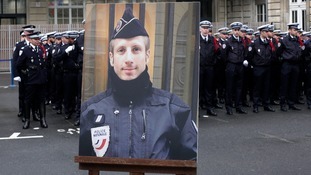 The 37-year-old officer was killed last week when an attacker fired an assault rifle on a police van parked on the French capital's iconic tourist avenue. Mr Hollande said the French people must "support the police", adding: "They deserve our esteem, our solidarity, our admiration." Mr Jugele had been among the officers sent to the Bataclan venue on the night of 2015's Paris attacks after three armed men with suicide bombs had slaughtered 90 people. He returned to the concert venue a year later as a spectator when it reopened with a concert by Sting as was quoted by People magazine as saying he was there "to celebrate life. To say no to terrorists". The Frenchman who killed Mr Jugele, Karim Cheurfi, was shot and killed by officers before his attack was later claimed by the so-called Islamic State group. Who was the Paris attacker Karim Cheurfi?